When you vacation at Mountain House Inn, you’ll definitely want to visit this unique gift shop nestled in The Village. 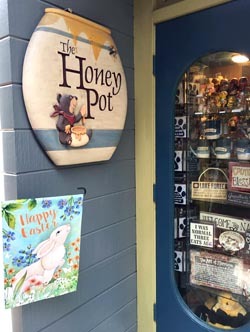 The Honey Pot is a darling nook chock full of sweet surprises! Shoppers from all over the world have stopped in to look at the signs with cute sayings, kitchen odds and ends, and cute collectibles. Have a long list of friends and family to buy souvenirs for? Look no further than The Honey Pot! Whether you’re getting a unique salt-and-pepper set (such as a pair of kissing dachshunds) for your neighbor or a delightful item from the store’s fairy garden décor corner for your mother, you’ll have a kick picking out something for everyone at this one-of-a-kind shop. If you collect the stunning horses that comprise The Trail of Painted Ponies collection, you may want to pick one up in The Honey Pot. Each time you look at your treasure, you’ll remember your trip to the Smokies and your time at Mountain House Motor Inn. Never seen one of the ponies? You may decide to start your own collection after seeing the fantastic grouping at The Honey Pot!! While their inventory includes absolutely adorable and colorful ponies, the line as a whole is an ever-evolving set of offerings that features everything from holiday-themed ponies to stunning Native-American-themed horses. There is truly something for everyone in this line of figurines. Prices for these ponies, as with most of the products in this gift shop, are very reasonable considering the quality offered! Russian nesting doll fans will have you doing a triple take upon entering The Honey Pot. There is a large curio packed with these timeless treasures. The colors will astound you! The Russian nesting dolls, also known as a Matryoshka, date back to 1890 and represent the warm heart and soul of Russian folk art. The concept originated in China, with nesting boxes dating back some 1,000 years to the Song Dynasty. Whether or not there is a collector in your family, someone in your entourage is sure to want a Matryoshka (or two) after seeing those offered by The Honey Pot. Remember, this darling shop is tucked inside The Village, mere walking distance from your motel room. Enjoy!